Very useful when working in confined spaces. This lift can reach a height of 26 foot. 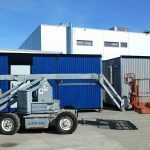 All lift and drive functions can be carried out by the user when elevated. Very useful when working in confined spaces. This lift can reach a height of 19 foot. All lift and drive functions can be carried out by the user when elevated. 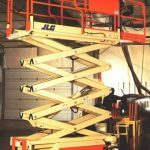 Perfect for cleaning, maintenance and repair work, this battery powered lift can reach a height of 40 foot. 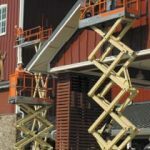 All lift and drive functions can be carried out by the user when elevated.